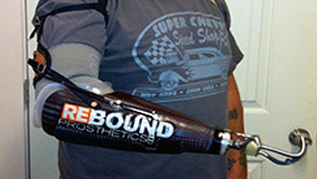 At Rebound Prosthetics, we build relationships for life. Chris Jones, CPO, and his staff evaluate your individual needs and work with you to create a custom solution. With an experienced staff and state-of-the-art lab, maximizing your quality of life is our top priority. To us, you’re not just a patient, you’re a person. NEWS UPDATES – For the latest news, photos and videos click here to visit us on Facebook. Check out Josh and Chris on the CBS show Game Changers. We have the best patients in the world. Click below to see what they are saying about us and our services.